I think someone’s angling for a goody bag from Roundy’s like James Lileks got. Of course the CEO will want you to be trying out his Roundy’s brand to see how it’s even better than “The Best”. That’s funny TMA, because I’m so Hellman’s oriented I could hardly imagine such a lame tag line for Best Foods — but of course it’s not lame at all, it makes perfect sense! Blasphemer! There is only the One True Kraft! Thou Shalt Have No Other Mayonase Before Me! What is a shopping “card”? Mayonnaise? My family pledged allegiance to Miracle Whip way back when. We thought that WAS real. Duke’s has been making superior mayonnaise in the state of Georgia for over 90 years. With no sugar added, it’s somewhat zingier and notably less sweet than other commercial brands I’ve endured. I believe that it’s only on store shelves in the South, but it’s also available through various online purveyors. Interested readers should do themselves a “blasphemous” favor and give Duke’s a try! Win, I am open minded about as-yet untried spreads. You’ve got to find out for me if it’s kosher — I don’t see any indication on the website that is has supervision. On the other hand, blasphemy indeed! I may have to delete any comments raising the issues of Miracle Whip, which is NOT mayonnaise! 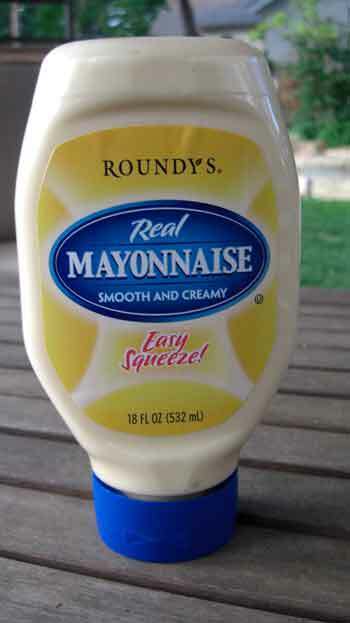 I wouldn’t be surprised if Roundy’s is actually selling repackaged Hellman’s mayo. Heck, I wouldn’t be surprised if Hellman’s designed those labels themselves. I wish there were a website somewhere where you could see which store-brands are actually a relabeled national brand, but I guess the national brands wouldn’t want those details known. Design-wise, I much prefer the serifs on the Roundy’s bottle to the 70s-looking Hellman’s. And their big blue oval is better than the Hellman’s… whatever that is. A superellipse? On the other hand, Roundy’s lags far behind Hellman’s in the blue ribbon department. Maybe they could add a blue flower or something. At any rate, I think their logo is just *barely* different enough to escape any infringement claim. I came by my lifelong insistance on only one mayo, Hellmans, genetically through my father’s line. My mother liked Miracle Whip and tried to slip it into sandwiches. But, otherwise, she was a really good mom. We’ve been involved in a God’s Own Condiment versus Curdled Cat Piss contest with an entrenched Kraftite for many years now. The entry I link to out of the archives is statistical research proving the superiority of Hellman’s/Best Foods in general. Like many in her left wing of the cracker Kraft condiment cabal, she refuses to accept documentation. I probably should have used a pie chart.